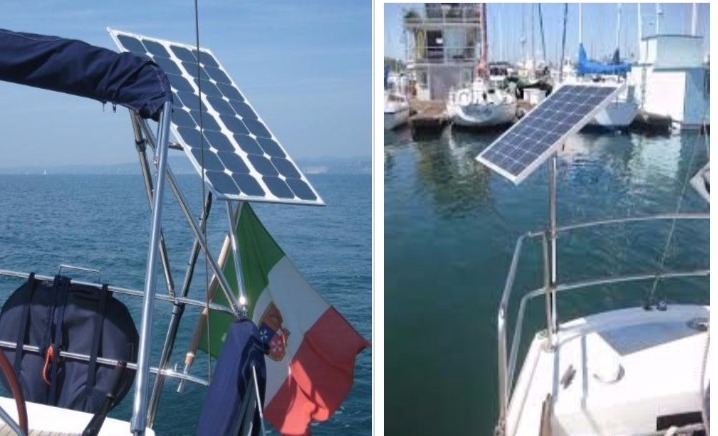 When you want solar on your boat... You Want Solar On Your Boat! Now, where you put it depends on what real estate you have available that is relatively free of potential shading and yet still gives you room to move around. Those of you with a sail boat need to be aware of the shadows cast by your mast, boom, and rigging. If you have a power boat, be aware of the shadows cast by your radar, arch, antennas, water toys, helicopter, etc. So, let’s look at what others have done. 1. Dingy davits are popular locations for either glass panels or lighter weight semi-flexible panels. The davits themselves should be specifically designed and fabricated to carry the extra weight. Notice the clever person who put lightweight panels in-line with the davits to allow easy access to the dingy and swim ladder. 2. Canvas dodgers and biminis are great places to mount flexible solar panels. These can be secured either with zippers or Velcro for easy removal, and is a fairly simple job for most canvas shops . These are almost invisible from water level. Only you know they are there. 3. Others prefer to put a frame over their canvas to support solar panels. This allows them to fold back the bimini cover, or remove it altogether, and yet still have solar power. 4. Decks and hard tops. Nothing beats being able to walk all over your panels with no worry of breaking glass. There is no glass in these walk-on panels, and they are designed to mount directly to a hard surface. 5. Of course, if you want to put glass panels on your hard top and don’t mind the weight and bulk, then go for it! 6. Lifelines – A simple place to hang panels; Out of the way, easily moved from side-to-side to follow the sun, and quickly removed and stowed below. 7. Sticks – put your lightweight solar panel on a sturdy backing panel and voila, solar on a stick! 8. 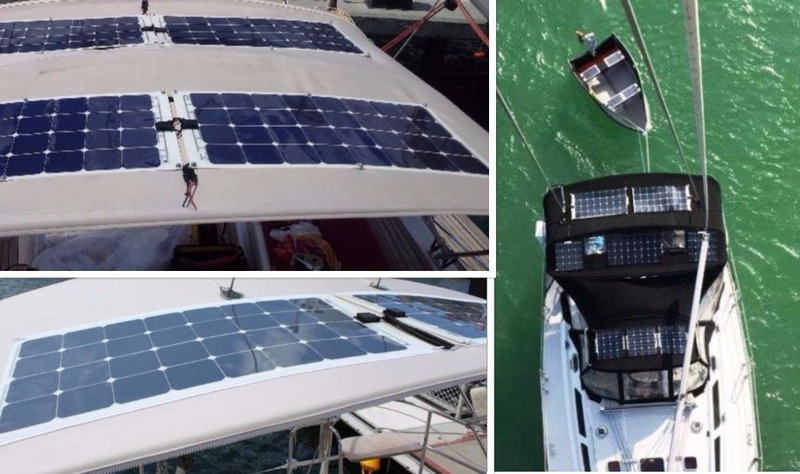 Sail covers have always been popular for a trickle charge over the winter and now sails themselves are coming into play as a place for solar panels. 9. Does your dingy have an electric engine? Why not have a dedicated solar panel near-by to offer a top-up between runs or while you’re having a private picnic in that secluded spot. 10. Then there are those who put solar all over their boat! These are the ones with a quest for a truly self-sustaining lifestyle. Whichever method you choose when installing solar on your boat – be prepared to attract admirers!